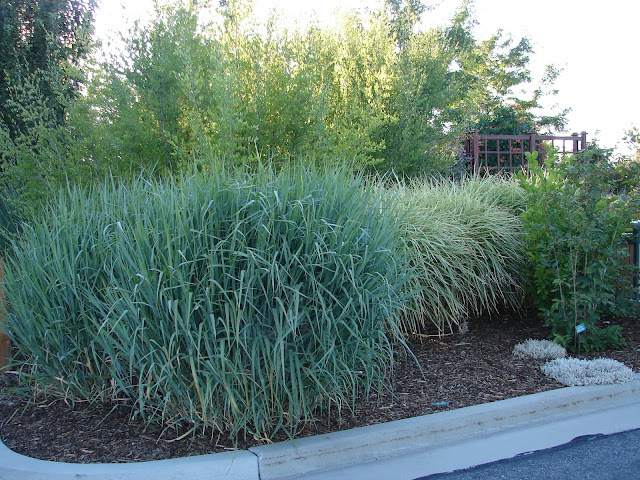 New Utah Gardener: Panicum virgatum 'Dallas Blues' - A "Must Have" For Utah Gardeners! Panicum virgatum 'Dallas Blues' - A "Must Have" For Utah Gardeners! Panicum virgatum 'Dallas Blues' is a huge and stunning ornamental grass. There are many varieties of Panicum virgatum, ranging in height from 2' tall to 6' tall. As one of the dominant species of the North American tallgrass prairies, Panicum is found all over the United States and into parts of Canada and Mexico. It is very waterwise and grows well in Utah. 'Dallas Blues' is one of the larger varieties of Panicum virgatum, and grows to be 5 or 6 feet tall! It's dusty blue color in summer and tan/pink color in winter make it an interesting addition to the waterwise garden. Make sure you give it enough space! dallas blue is looking great, how many years did it take to get this big? In my experience Dallas Blues gets 5 feet tall in 2 years. It takes several more years to get 4 feet in diameter.